With more than two billion active monthly users, Facebook is the place to be for enterprising product owners and marketers. Add to this Facebook's diverse array of tools that marketers can use to gain powerful insights from their campaigns and it's easy to see why Facebook is one of the most attractive digital platforms for advertisers of various sizes from various market segments. And yet, far too many campaigns, although well-intentioned, fail to create the impact they seek in terms of conversions. For advertisers, that means a considerable amount of their budget is being flushed away with nothing to show for it. This money could have easily earned them a larger audience and potential buyers if they could only fix what they were doing wrong. The good news is that it doesn't have to be that way - often it's just a simple error that you need to fix, or a process change you need to implement. Here are two of the most common Facebook advertising pitfalls, and how you can avoid them to improve your advertising returns. No doubt you've heard this before, but it certainly bears repeating. With Facebook advertising, there is no one type of ad that works for everyone. Worse, what worked for you once could easily fail to generate the same type of impact the next time around. This is where testing comes into play. 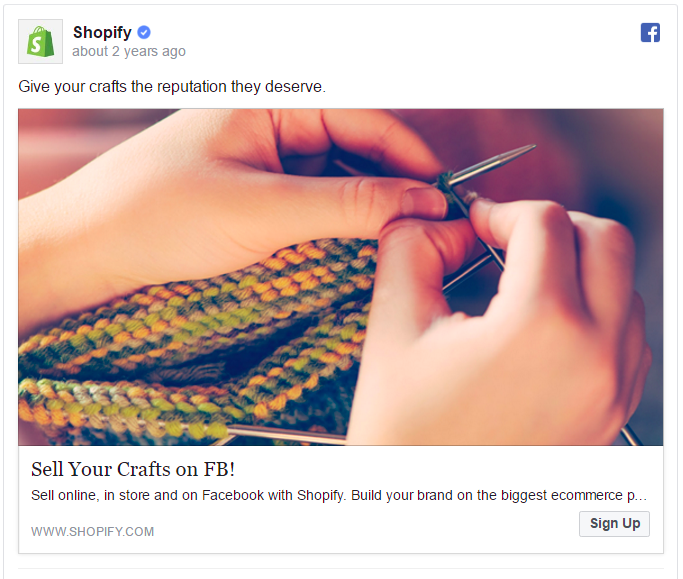 From choosing the most impactful images to creating punchy headlines, to experimenting with your audience demographics, there are several ways to use Facebook's advertising toolkit to your advantage. To begin, develop a three-dimensional view of your target audience by putting yourself in their shoes. Ask yourself what these people would Google, the Pages they would Like on Facebook, apps they would be most likely to use, blogs and publications that would appeal to their sensibilities and any competitors that may already be buying from. 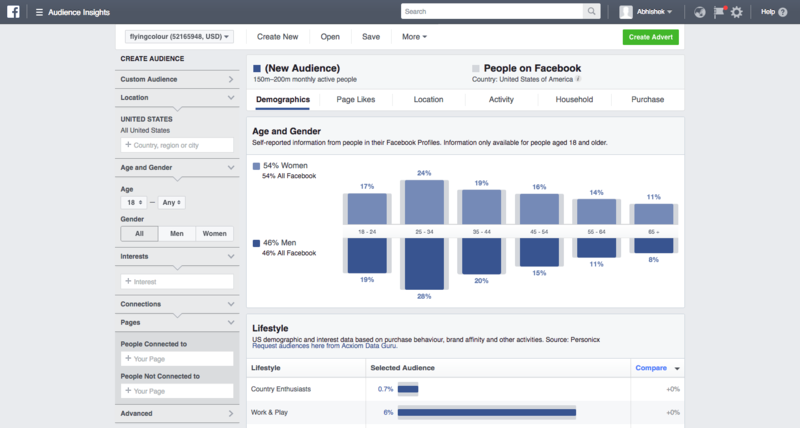 Use Facebook's Audience Insights for additional targeting ideas based on the interests and qualities of your target demographic. The key is to select a very narrow, focused audience where possible. Hone in your pool based on interests and other attributes, in addition to the more obvious parameters of gender, age and language. Here, also bear in mind the Facebook's cost per click is higher for some age groups than others, which makes it especially important to choose your audience wisely. You could also consider conducting audience research before beginning your Facebook campaign to better understand your audience and their behavior. Next, focus on the quality of your ad. 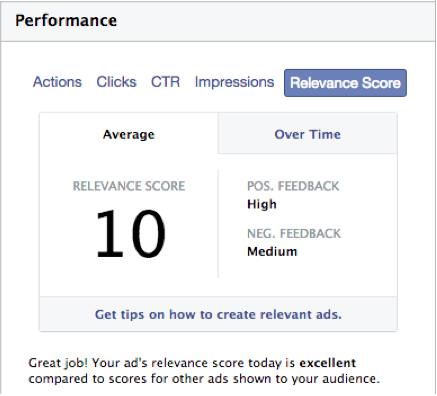 Facebook helps out a little by offering you a relevance score that measures how relevant your ad is to the audience you're targeting. The more relevant the ad, the less you'll pay for advertising. Of course, a higher relevance score doesn't automatically translate into better conversions - it really just means that people who were shown the ad reacted positively to it. When designing your ad, remember that visuals are everything - a strong image will speak louder to your target audience than even the most compelling copy ever will. Create ad sets with multiple images to narrow down the images that attract the most attention from your audience. If you need any further convincing, remember that the Facebook advertising leaders are already doing this - award-winning Egyptian fashion house 'Temraza Haute Couture' knew that the right visuals would make all the difference to how their ads were perceived by their audience. The designer conducted rigorous testing for her images and videos to determine the type of imagery that was yielding the highest number of positive interactions. The hard work paid off: Temraza's video ads received 20,000 views and her sales increased by 55% in six months. Shopify, meanwhile, tests out nearly identical images with slightly different hues and layout to find out which factors work best with its intended audience. Remember, though, that just because one audience set didn't react well to a particular image, it doesn't mean that the image is ineffective or unattractive. Audiences of different age groups, geographies and interests could react differently to the same image - while bold ads work well with certain people, certain others have become desensitized to eye-catching visuals and are more likely to notice a lighter ad. Also experiment with ad placement - research conducted by AdEspresso found that while desktop ads had a much higher cost-per-click than their mobile counterparts, mobile ads actually failed to produce any conversions. Mobile users are more likely to get distracted and are usually more suitable for simpler products that do not require much investigation. Choose your ad placement based on the type of product as well as the characteristics of the audience you're targeting. Audiences can be very fickle, and not paying attention to how well your ad is performing could lead to you spending increased amounts on costs per conversion. This is especially important if your audience is niche or very carefully targeted; your campaign will soon saturate your audience, making subsequent conversions unnecessarily expensive. It's recommended that you check in on your Facebook campaigns once a week to determine how well your ads are doing. Check for factors like ad frequency, relevance score, click-through v/s conversion rates, number of leads and engagement rates. Ad frequency is a particularly relevant one - while you'd normally expect audiences to get bored of your ad after the first couple of times, research actually indicates that the likelihood of them clicking through increases when they're shown the same ad three to five times. This changes when you're remarketing, as the SaaS startup Scoro found - their remarketing campaign showed good results with a frequency of ten or more ad views. 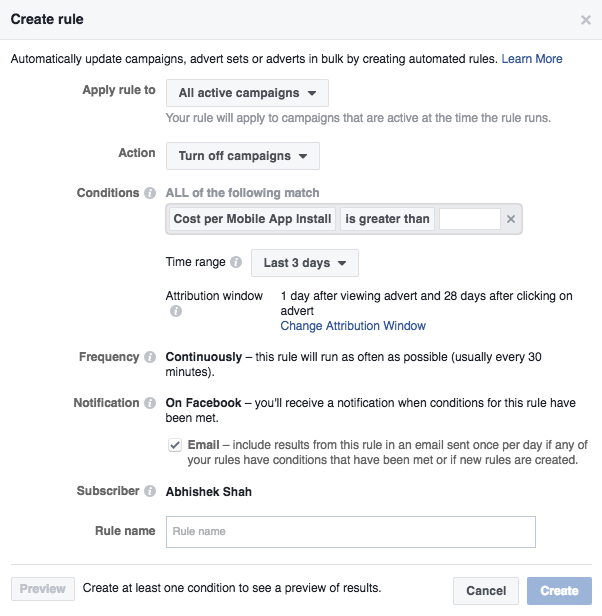 If you can't afford to spend too much time on your Facebook campaign, you could also consider leveraging Facebook Automated Rules, which ensure that your campaigns will be automatically turned off once certain conditions (defined by you) are fulfilled. These parameters can include 'cost per result', 'cost per link click', 'cost per app install' and daily spend, frequency and reach, among others. Create automated rules for one or several campaigns to be notified when your campaign starts yielding lower results, and keep costs under control. As with most things that matter, succeeding with Facebook advertising requires a decent amount of patience and willingness to persevere. It also requires you to keep tweaking and experimenting with your ad sets and audiences until you've found one (most likely several) sweet spots. But the rewards of conversions and revenue you'll reap in the end will undoubtedly ensure that the ride is worthwhile.